NHK announced last week that it will present the anime/documentary series about athletes. The first episode adapts material from Tomoyoshi Itou and Shingo Morita's Weekly Young Jump biographical manga Eikou Naki Tensai-tachi (Geniuses Without Glory) — specifically the story about Hironoshin Furuhashi, the swimmer also known as "the flying fish of Fujiyama." 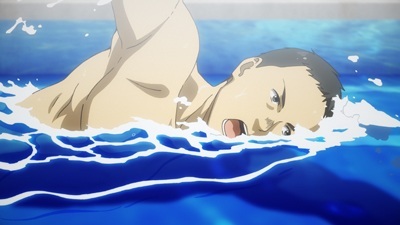 The episode also includes interviews with Olympic swimmer Kousuke Kitajima and other Japanese swimmers about the how Furuhashi changed the Japanese competitive swimming world, as well as what sort of training is required to be an Olympic swimmer.